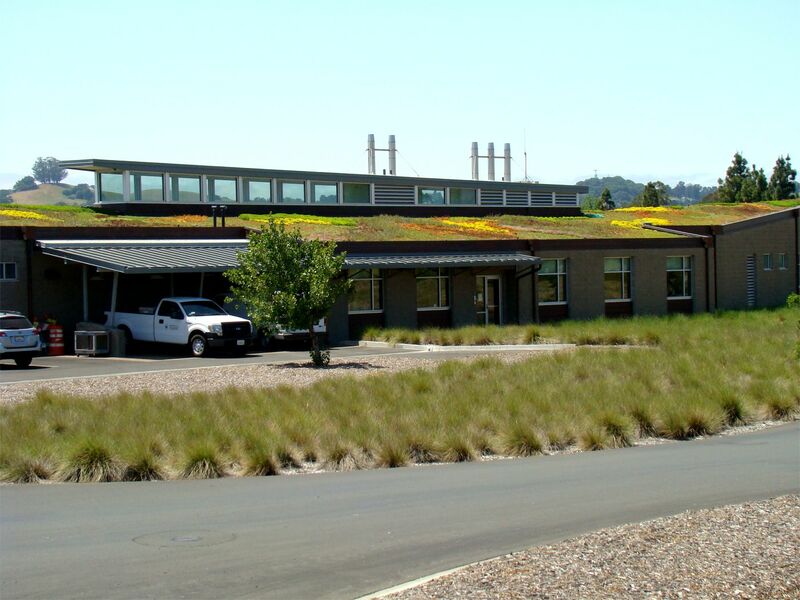 The Ellis Creek Water Recycling Facility is located at 11 English Street, Petaluma, CA 94952; 707.778.4350. 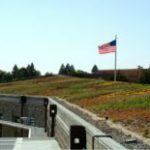 Read about the facility from water-technology.net. 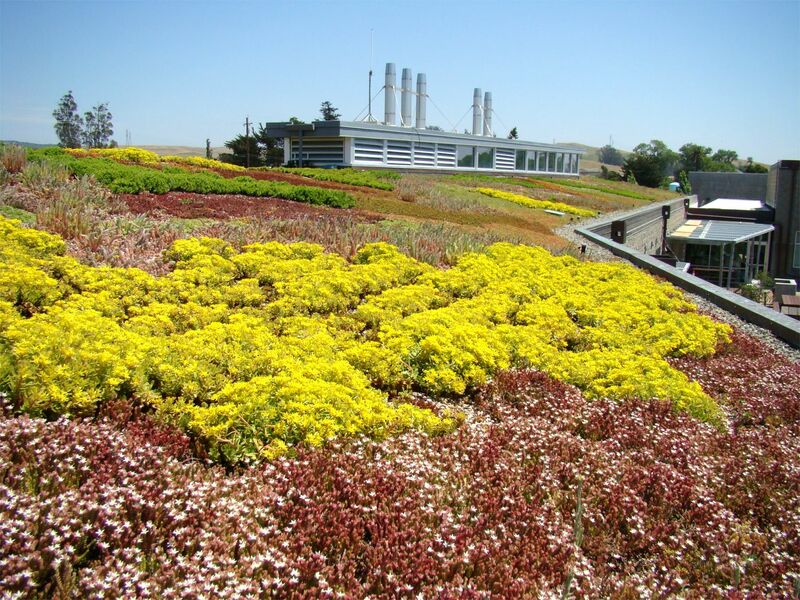 See the project profile from the City of Petaluma, SYMBIOS and its photo gallery. For more information on the Ellis Creek Water Recycling Facility living roof, contact Kevin Falkerson, Principal, and Kerrie Lee Cole of SYMBIOS eco-tecture at: [email protected] Learn about the following companies in The Greenroof Directory: Tremco; Emory Knoll Farms / Green Roof Plants; and SYMBIOS eco-tecture. 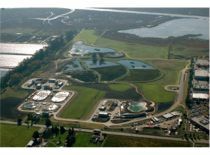 Opened on July 31, 2009, the $115m Ellis Creek Water Recycling Facility is operated and maintained by the Petaluma Department of Water Resources and Conservation. 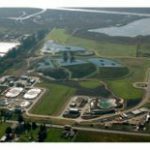 Producing about 2,200 million gallons of disinfected recycled water annually, the plant operates 24 hours a day, seven days a week, combining natural wetland treatment processes and state-of-the art technology to provide recycled water to the city. It increases the capacity of average dry weather flow from 5.2MGD to 6.7MGD. 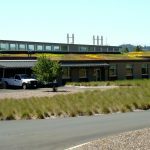 The Ellis Creek Water Recycling Facility has two buildings that were designed with extensive living roofs. 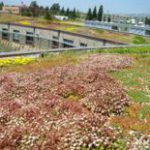 Together the roofs total approximately 12,174 square feet of planted-in-place/integrated living roofs with a 2:12 slope. 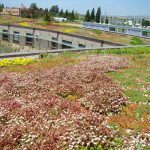 The “green’ living roofs were incorporated into the facility’s design program to demonstrate the viability of this technology toward promoting environmental sustainability. 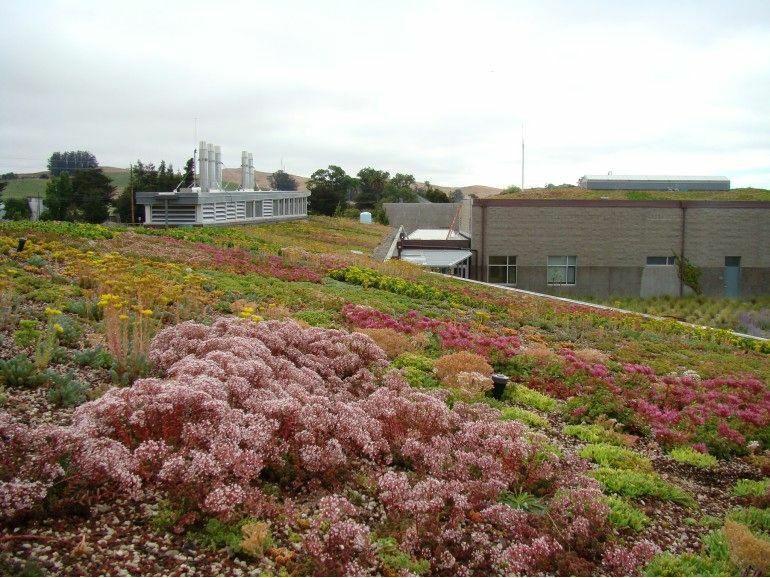 During the initial build-out of the Water Recycling Facility in 2009, the construction team installed a green roof system that eventually failed to successfully develop. 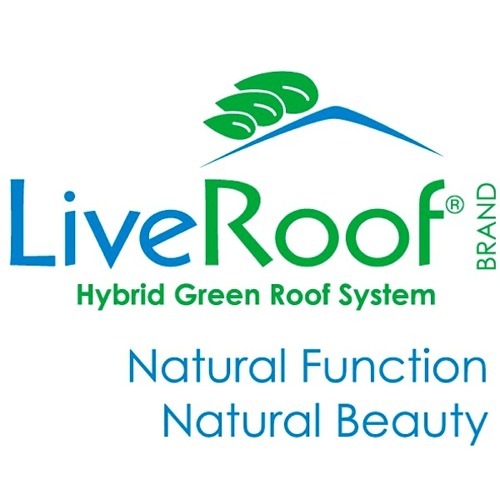 After conducting an assessment report in 2011, SYMBIOS was hired and initiated a complete overhaul of this initial roof system. 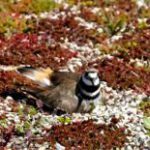 The new design featured a planting plan that specified 13 species of hardy groundcover succulents. 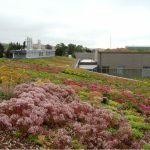 The planting scheme took advantage of the fact that the roofs are primarily visible from the surrounding roadways and the immediate ground landscape areas. 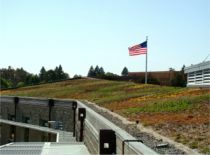 Therefore, a planting plan was developed with sweeping fields of succulent species to create an impression of flowing movement that follows (reflects) the main axis of the building. 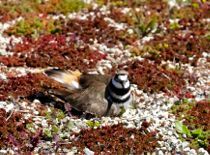 Before planting occurred a soil test confirmed that the existing soil medium needed bolstering so we added a thin layer of specially design living roof soil mix amended with bio-nutrients. In addition, the sub-surface irrigation system was re-designed and replaced with a new overhead highly water-efficient spray system. 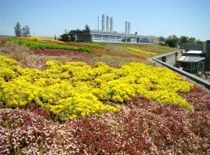 The roofs are irrigated directly by utilizing the tertiary treated wastewater from the facility’s operations. 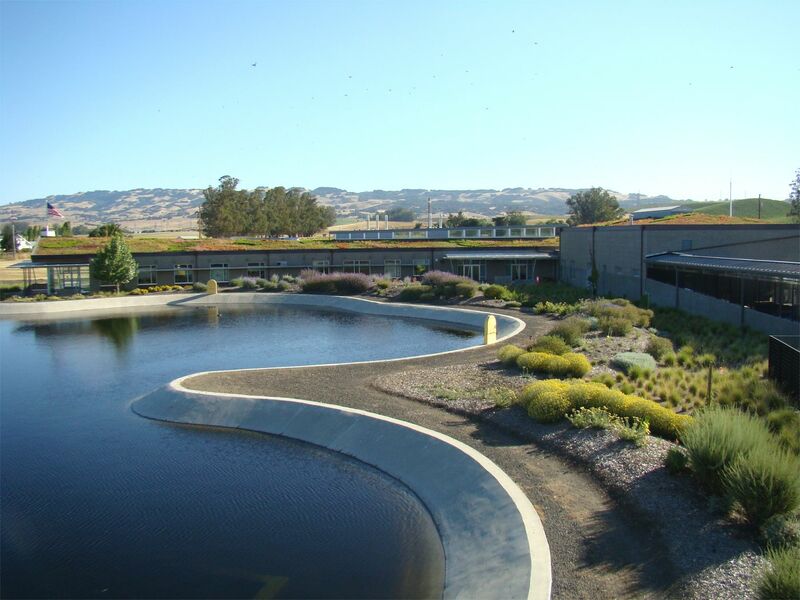 The recycled water is held in an open-air sculpted holding pond that is situated adjacent to the buildings with the living roofs. The recycled (wastewater) allows the vegetation to be irrigated without the use of any potable use of water. 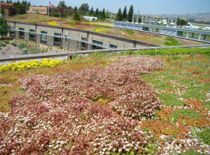 In the western United States where seasonal drought is an annual event this green roof project clearly demonstrates the appropriate use of this reclaimed water resource. 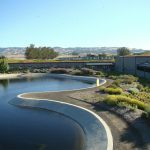 During the annual dry season (summer/autumn), the recycled water is introduced into the City’s recycled water system and used for irrigation of agricultural lands, two golf courses, vineyards and the treatment facility’s two greenroofs. 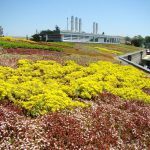 The city currently generates over 700 million gallons of ‘grey’ water per year, which could theoretically support millions of square feet of green roofs. 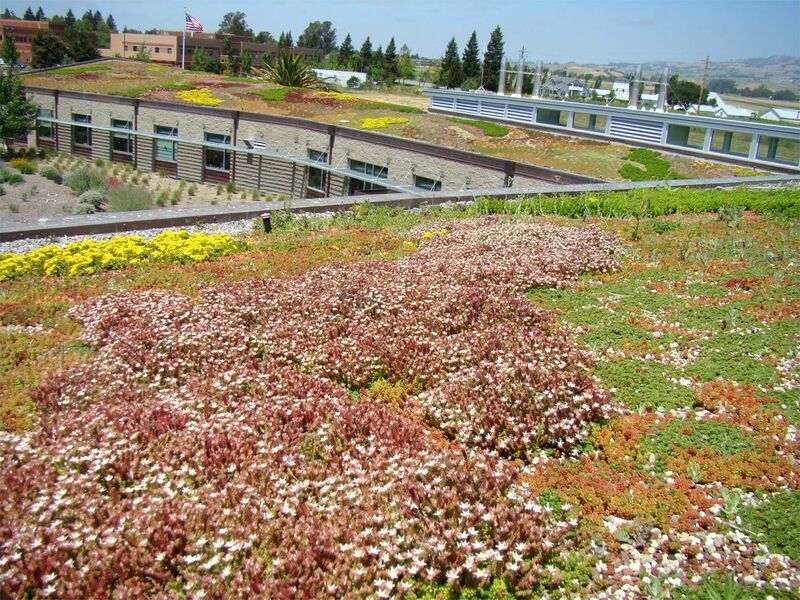 SYMBIOS is currently working the city’s Department of Water Resources to develop some educational material and outdoor interpretive boards for increasing public awareness related to the benefits of greenroofs. 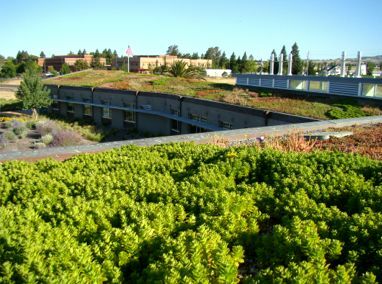 In order to meet a net zero runoff requirement goal for the project the living roof was integrated with a series of ground level bioswales and rain gardens. By combining the two systems together we have been successful at keeping all of the stormwater on site.